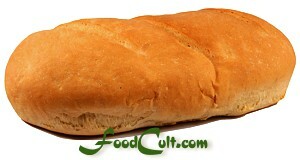 One Loaf of Basic Italian White Bread! Add one cup flour and beat 100 strong strokes with a wooden spoon (or in an electric mixer until absolutely smooth). Knead the dough JUST until it is smooth. If the dough is still a bit sticky dust it with about ¼ cup flour, cover it and let it rest for about 10 minutes. Knead the dough, again, for about 7 minutes - until it's silky-smooth. Add flour in small amounts only until the stickiness is completely gone but the dough is not hard and dry. If using a dough hook - Finish the kneading by hand - allowing you to feel the dough's texture and stickiness. Place the bowl in a warm, draft-free place (we use the oven with the oven light on) and let it rise for 75 minutes (or until the dough has doubled in bulk). Knead the dough using the pull and fold method as illustrated here ... pulling one side out and folding it over, then pull the other side and fold it. Pull the bottom out and fold it upwards, then pull the top out and fold it down. Repeat this process one or two times until the dough becomes stiff and holds shape. Form the loaf by making the seam, on the final fold, with the heel of your hands (as shown here), pinching the ends and tucking them under to create a nice, smooth end. 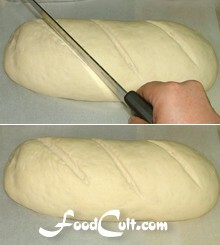 Roll the dough to the desired shape (length and width) under hands curved to force the dough into shape. This dough should be formed to a length of between 12 and 16 inches (30 and 40 cm). Place the loaf on your baking sheet and cover it with a dry, lint-free tea towel and let rise in a warm, draft-free place for 40 to 50 minutes or until double in bulk. Place a shallow pan of water on the lowest shelf of the oven and preheat the oven to 400ºF (205ºC). Slash the top of the loaf (gently so as not to collapse the dough). Cover the dough again while the oven heats. Remove the tea towel (or other cover) and place loaf in middle of hot oven and bake for 25 minutes. After 25 minutes remove the pan of water, lower the temperature of the oven to 350ºF (175ºC) and bake for about 15 minutes or until done. Cover the loaf, loosely, with a piece of foil to keep the top of the loaf from darkening too much and to prevent too deep a crust. Optionally: Finish the baking (the final 3 to 5 minutes) on a pizza stone or stone tile (should already be in the oven if you will use it - it will, otherwise, crack - Click Here to learn about use and care of your pizza stone). A Bread-baker's Tip: Covering the loaf with foil in the final stages of baking yeilds a softer crust. If you like a very soft crust cover it earlier in the second stage of baking. Do not cover the loaf in the first stage of baking. To soften the crust bag your bread in plastic for a minimum of 4 hours ... or even more but only after the loaf cools fully. As with most of our recipes, pretty much no special tools are required to make this basic Italian white bread. This Italian white bread recipe is very like our French bread - the primary differences being that it uses, specifically, olive oil and no diary (or dairy substitutes). The dough itself is a little bit saltier but there is no wash or salt surface on this bread as with the French loaf. Like basic white bread, this loaf is bread crumbs - un-crumbed ... it is a good foundation bread suitable for french toast (once it has staled a bit). It is a wonderful base for so many things including bruschetta, or garlic bread. If you are of the Jewish faith, it is Pareve (can be used with milk or meat) and, for Muslims, it is halal as it uses no meat fat. Like the basic white bread, this bread is a pallette for what ever decoration or topping may strike your fancy. Mostly oil free, this loaf of about 1 ½ pound (around 675g) has only two teaspoons of salt and even less sugar. While you may elect to make small adjustments based on taste, this vegan loaf is a wonderful, rustic looking foundation bread.